Add an elegant touch to your decor with the Liberty 1-1/2 in. Satin Nickel Roped Knob with Back plate. Enhance the cabinetry throughout your home with this sophisticated look. Fasteners included for easy installation. The Amerock BP29368G10 Candler 1-1/2in(38mm) LGTH Knob is finished in Satin Nickel. The Candler collection is distinctively elegant, with strong lines and soft curves that blend a touch of femininity with enduring class and timeless character. The classic Satin Nickel finish provides a sleek, lightly brushed, warm grey metallic look. The Amerock BP29203G10 Conrad 1-1/2in(38mm) LGTH Knob is finished in Satin Nickel. Inspired by recent resurgence of contemporary and transitional kitchen design, the Conrad collection's clean flowing lines merge with strong edges to create the perfect look for your kitchen or bath. The classic Satin Nickel finish provides a sleek, lightly brushed, warm grey metallic look. 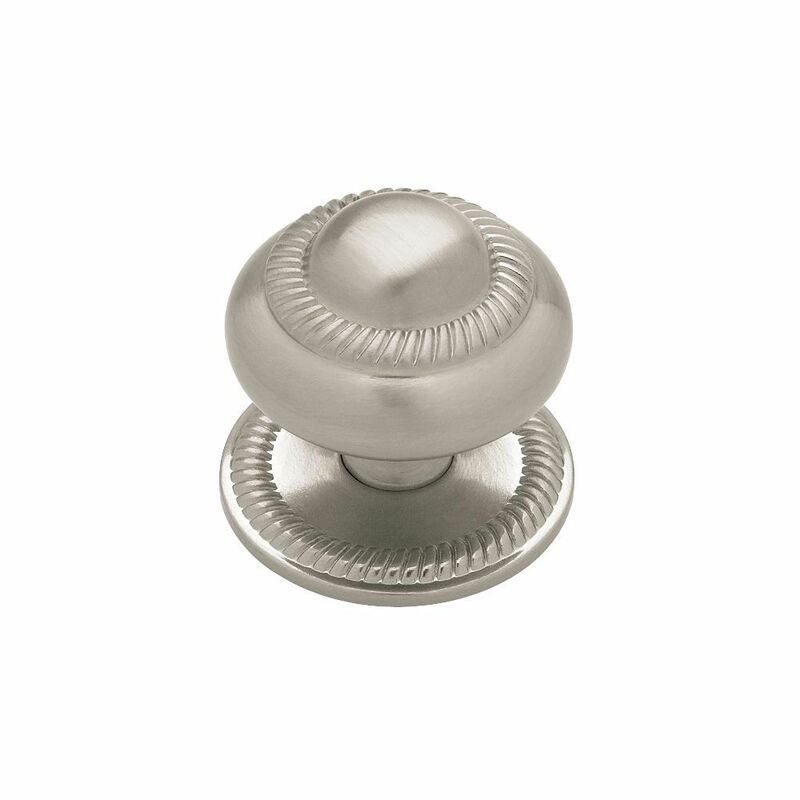 The Amerock BP29398G10 Extensity 1-1/2in(38mm) LGTH Knob is finished in Satin Nickel. Extensity features beveled curves and a stately arc. The classic Satin Nickel finish provides a sleek, lightly brushed, warm grey metallic look. The Amerock BP36614G10 Sea Grass 1-1/2in(38mm) LGTH Knob is finished in Satin Nickel. Sophisticated finishes meet organic inspiration in the Sea Grass Collection. Slender rays mimic the setting sun or delicate fronds, connecting your senses to textures found in nature. The classic Satin Nickel finish provides a sleek, lightly brushed, warm grey metallic look. 37mm Roped Knob with Back plate Add an elegant touch to your decor with the Liberty 1-1/2 in. Satin Nickel Roped Knob with Back plate. Enhance the cabinetry throughout your home with this sophisticated look. Fasteners included for easy installation. 37mm Roped Knob with Back plate is rated 4.7 out of 5 by 18. Rated 5 out of 5 by Gonzo from The product was definitely quality material. I was surprised by the weight for such a small piece... The product was definitely quality material. I was surprised by the weight for such a small piece of metal. It is serving its purpose as a bifold door knob. Rated 5 out of 5 by Honeydew from Purchased the original ones about 10 years ago and was... Purchased the original ones about 10 years ago and was delighted to find they were still available, Had to replace 2 of 6. Price was right, delivery was swift. No problems. Would do it again this way if needed. Rated 5 out of 5 by Cheryl from Beautiful accents for a stainless steel kitchen! Sturdy and... Beautiful accents for a stainless steel kitchen! Sturdy and strong. Rated 5 out of 5 by Susan from Love these knobs. ... Love these knobs. Rated 5 out of 5 by Parnelli1047 from They look so beautiful on my dark cabinets next to my stainless steel appliances!! They look so beautiful on my dark cabinets next to my stainless steel appliances!! Rated 5 out of 5 by MitzyPerry from Beautiful and versatile These all looked identical and the screws were correct. I like that the backplate is optional--the panel of my new island doors was a bit too narrow to use it, so I left it off and the knobs are still gorgeous. In my master bath, the backplate fits and they also look gorgeous. Rated 5 out of 5 by Clent from Cabinet knobs The knobs and handles were not easy to locate in the quantity we needed. We had to travel to four stores in order to find enough for our remodel project. The color and finish was inconsistent and thus required a close inspection of each item.